Uluru Rock stands magnificently against the surrounding flat landscape of the national park. Easily one of the most spectacular natural areas in Australia, Uluru Kata-Tjuta National Park is well-known for its massive red sandstone formation, Uluru Rock. Also known as Ayers Rock, this monolith holds significance as a sacred Aboriginal site and has been recognized as a UNESCO World Heritage site. It stands an impressive 350m tall in stark contrast to the surrounding flat landscape, wowing visitors with its grandeur. Surrounding Uluru Rock, travellers can enjoy a number of activities, diving in pristine swimming holes and fresh springs, go bushwalking to discover the rock art and cultural history of the Anangu people, spot unique species of birds, or slow things down while dining during the breathtaking sunset over Uluru. After an enjoyable day around the park, you’ll want a good night of rest. 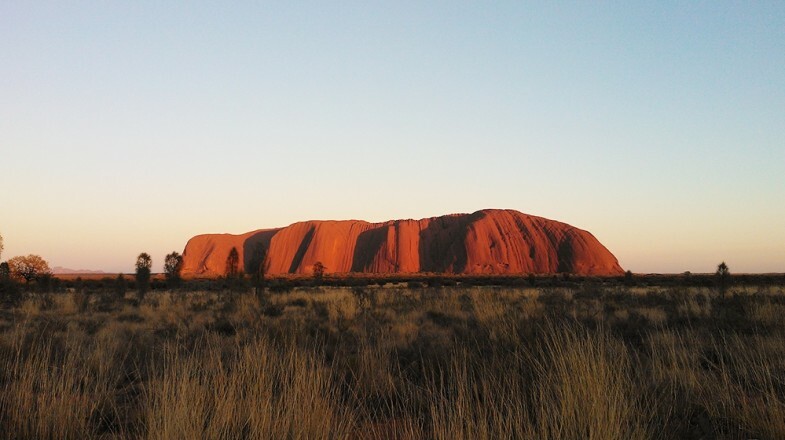 The list below provides a brief overview of options for accommodation in Uluru, including hotels and camping in Uluru. 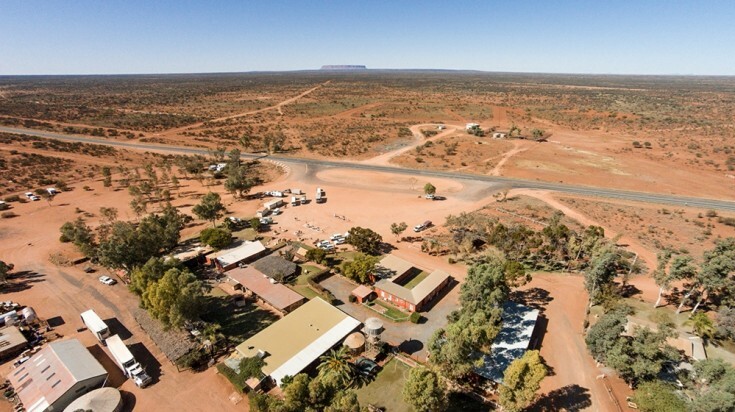 While no lodging is available inside the park itself, a range of places nearby Uluru Kata-Tjuta National Park are available. 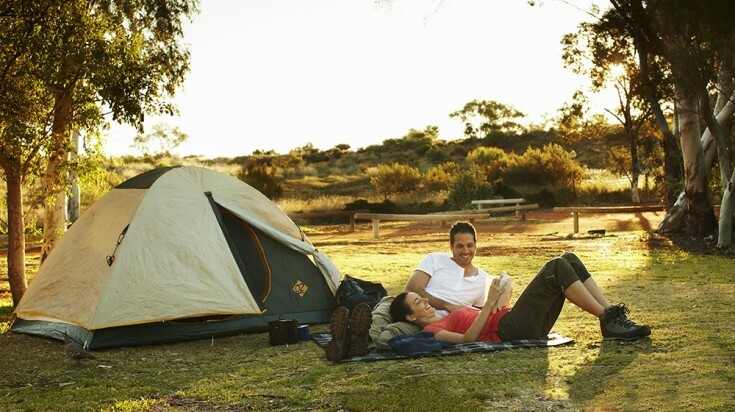 Camping grounds are available within the Ayers Rock Resort. Part of the expansive Ayers Rock Resort, this campground is a great choice for its close proximity to Uluru Kata-Tjuta National Park. Offering a range of options including primitive tent sites, a powered caravan park, and simple air-conditioned cabins, this campground is an excellent choice for budget-conscious travelers seeking connection with the outdoors. As a bonus, guests can enjoy amenities and activities offered throughout the greater resort compound. 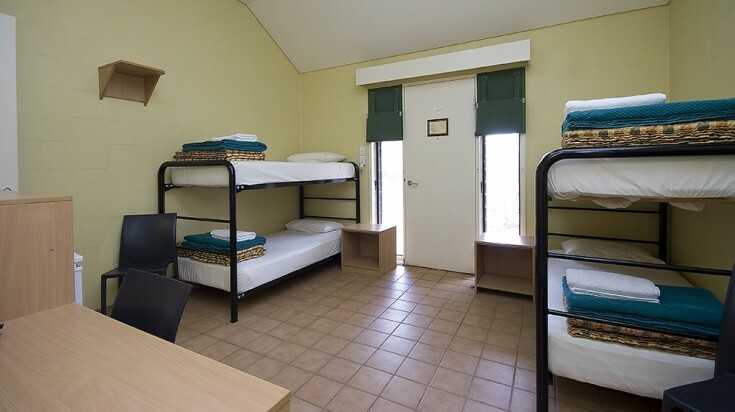 Curtin Springs Wayside Inn is an affordable yet comfortable accommodation near Uluru. Simple and affordable, Curtin Springs offers basic rooms, en-suites, family rooms, and campsites on the property of a remote, working cattle ranch. Though further from Uluru, this place is a special find for those seeking a free place to pitch a tent or self-powered caravan as non-powered sites are available at no cost in the Uluru. People traveling with pets will appreciate the pet-friendly campground. In Desert Gardens, guests can enjoy the scenic view of the desert and the Uluru rock. 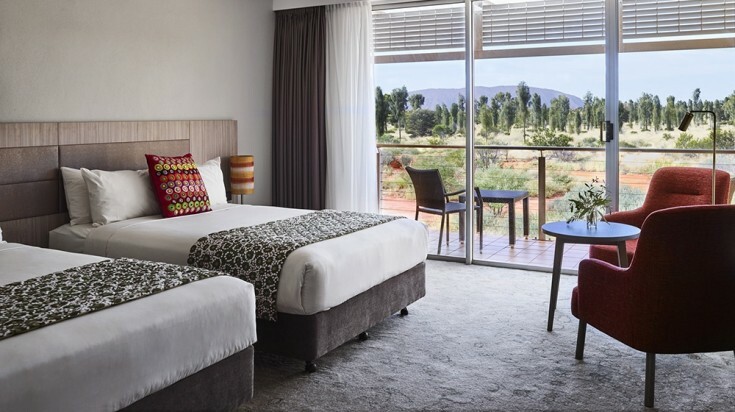 Guests here wake up to impressive views of Ayers Rock from chic guestrooms. A lovely outdoor dining terrace provides a relaxing place to enjoy a meal surrounded by native gardens. Located within Ayers Rock Resort, guests have access to a wide variety of other amenities nearby. Facilities: Restaurant & bar, swimming pool, free in-room WIFI; access to Ayers Rock Resort amenities including more restaurants, bars, shops, galleries, a supermarket, a spa and tour and information center. A real gem for travelers seeking a luxurious, all-inclusive eco-conscious experience, Longitude 131 offers unrivaled views of Uluru Rock. With premium tented pavilions, stylish contemporary campaign furnishings and expansive outdoor spaces, this is a basecamp with an exclusive feel. The Outback Pioneer Hotel has simplistic lodging for the budget savvy. 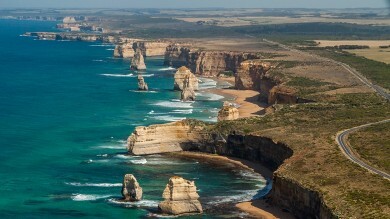 This place is perfect for backpackers and the budget-savvy. Offering simple rooms with private or shared bathrooms as well as dorm beds, guests will appreciate putting money towards other things, such as adventure or culinary tours. A good choice for those seeking to balance modern luxury with affordability, Sails in the Desert offers nice guestrooms and suites. Guests can upgrade to a terrace room for a spacious private outdoor lounge. The pristine outdoor swimming pool and brasserie-style restaurant are also excellent features. Emu Walk Apartments is located within the Ayers Rock compound which means guests can enjoy the resorts amenities while staying here. Emu Walk Apartments offer comforts of home with enough space for a family. 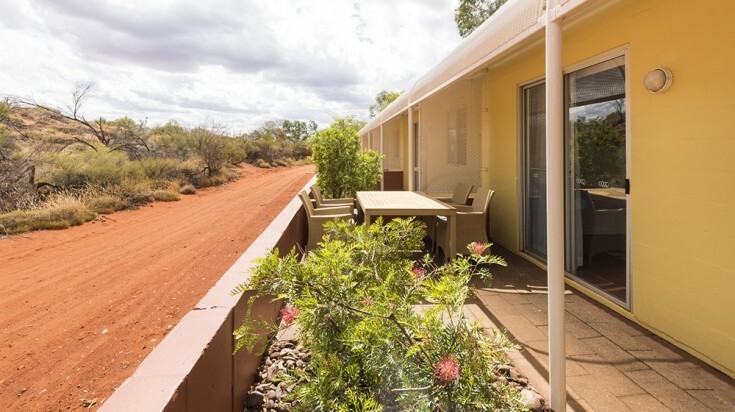 The best option for families and groups traveling to Uluru is Emu Walk Apartments. 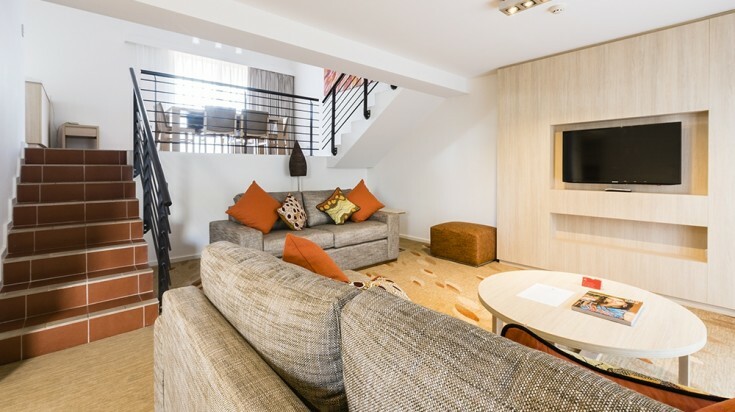 With the conveniences of hotel amenities, these modern 1-2 bedroom apartments offer the comforts of home. Each apartment is fully equipped with a kitchen and separate living area. Guests can enjoy the pool at the nearby Desert Gardens Hotel as well as amenities offered throughout the greater Ayers Rock Resort compound. 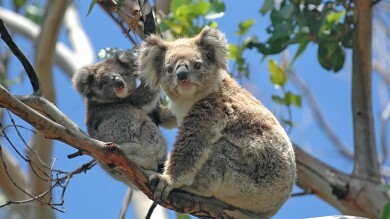 Located much further from Uluru, Kings Canyon Resort is a worthwhile option to consider. Travelers seeking to partake in experiences in both Uluru and Kings Canyon may appreciate this option for its accessibility to both areas, though it may require more planning. Coach transfers are available between Uluru and the resort on Mondays, Thursdays, and Saturdays. The resort offers a range of accommodation options in the campground and caravan park, shared and private dorms, or resort rooms. The campground is pet-friendly. Enjoying the impressive landscape in Uluru Kata-Tjuta National Park is a quintessential experience in the Australian outback. With incredible natural sights, delicious BBQ cuisine, and intriguing cultural experiences, this is a trip that satiates the senses. From pitching a tent to soaking in resort-style luxury, using this list of accommodations in Uluru, you will be able to plan a trip unique to your travel style. Note: Hotel and accommodation rates are as per 2017 pricing.